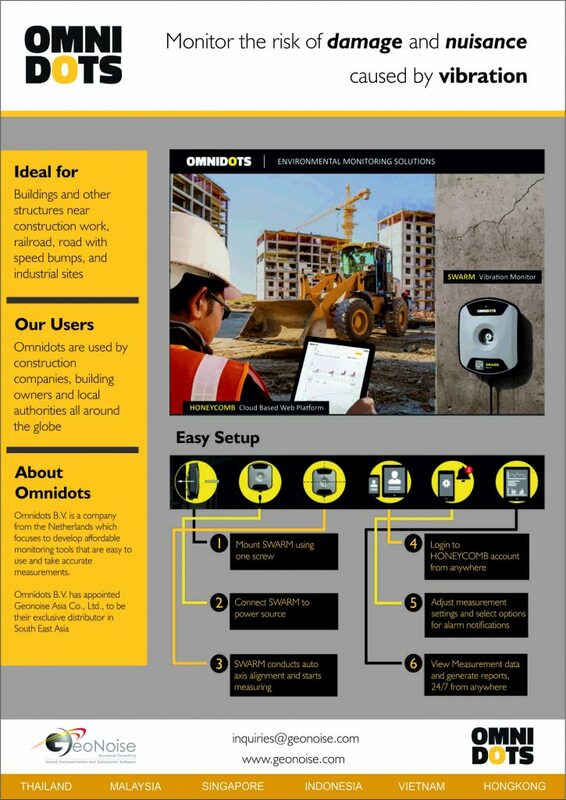 Omnidots, vibration monitoring, protect your structures, buildings in any surrounding where (damaging) vibrations may occur. Ideal for structures near construction sites, railroads, road with speed bumps and industrial sites. The setup and usage is very simple, mount the OMNIDOTS SWARM using just 1 screw, connect the unit to a power supply (outlet, battery or solarpanel), SWARM will auto allign the axis and starts measuring. Omnidots, SWARM, Monitoring vibrations on a large scale, Measurement data in the cloud. Easy assembly. Swarm is Omnidots’ vibration monitor to bring vibration measurements within everyone’s reach. Honeycomb is the Omnidots web platform, on which measurements are collected and processed into insightful data. The results of the measurements can be accessed via Honeycomb with a computer, tablet, or smartphone, 24 hours a day, 7 days a week. Honeycomb offers different modules in which the measurement data has been converted into graphs and can be processed into reports. Vibrations measured by the Swarm are tested against the DIN4150 and Dutch SBR guidelines. These guidelines are available for guidance when measuring and assessing damages and inconvenience caused by vibrations. And with one glance at Honeycomb, you can determine whether the vibrations remain within set guidelines. Multiple measurement points can be monitored within Honeycomb. A large number of Swarms can be used to take measurements within one project. This unique concept makes it possible to measure the impact of sources of vibration on objects located in the area around this source. The map shows you where you have installed Swarms. You can consult your measurement data with a computer, tablet, or smartphone, 24 hours a day, 7 days a week. One overview for all events and control over which notifications you do and do not want to receive. Measurement data in Honeycomb can be exported in CSV or Excel format. Contact us for a demo in SE Asia.